We don’t have a basement at the Blue Cottage, and we don’t even have a shed yet. So where does everything end up? On our porch. It was filled with boxes and bikes and building supplies all winter, but now it’s spring and I want that porch to look nice and be able to enjoy it. 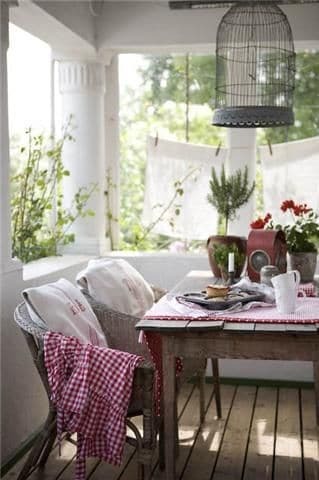 We don’t have space for a big table on our porch, but I like the rattan chairs and the grain sack pillows in this picture.You know about my love for grain sacks, I even curated a collection of grain sacks for sale on eBay. My favorite idea: the linens on a clothes line! 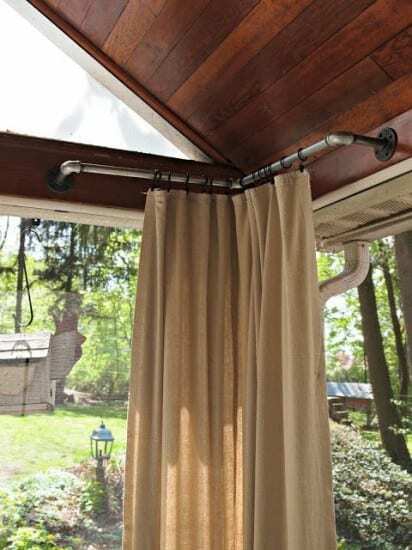 It mimics what I did with the dish towels and tension rods in our living room — it gives you added privacy but lets in light. Plus, I have two bird cages, and now that I see this idea, I want to put them out on the porch. 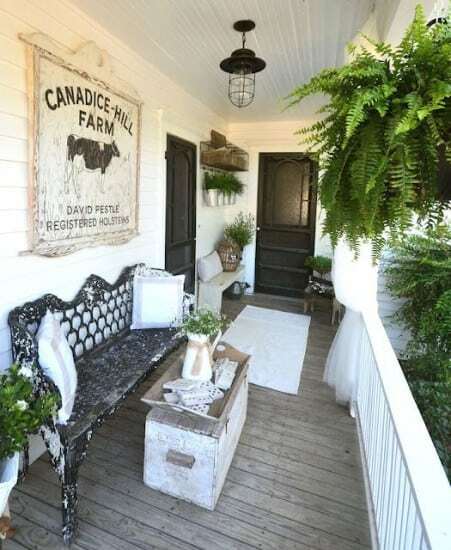 I definitely want to find a cool sign for our porch, and a cute bench. And I like the crate table. 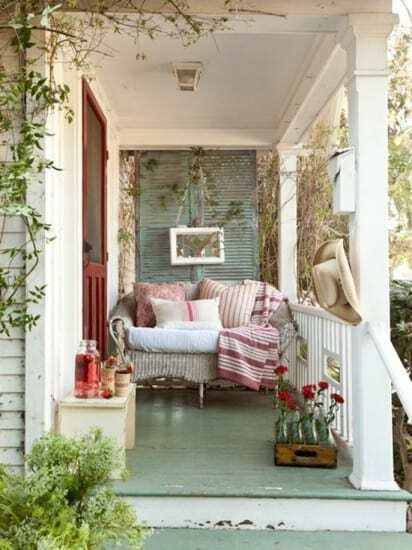 Another great idea for more privacy and to make the porch feel more like a room is hanging burlap just in the corners. I would use inexpensive drop cloths since they let in more light. I already have an old crate and vintage bottles, and even a little step stool like that. It’s in my store right now — I might have to steal it back. I also like that grain sack pillow with the one red stripe. Our porch is small, and there are a lot of things I want to add to it. Wish me luck that it’s all going to fit! 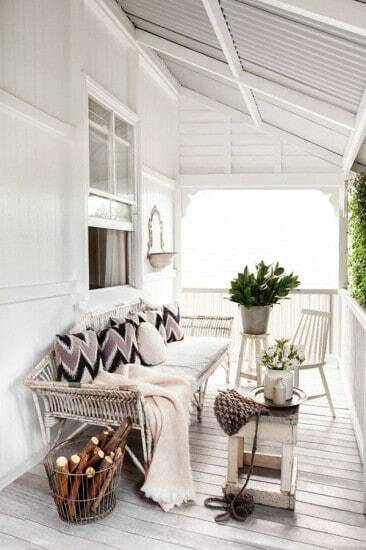 Do you have a porch at your home? Do you enjoy decorating and using it? Love all the inspiration you gathered! We love our front porch and use it the most this time of year. Great inspiration, I am thinking of doing curtains on my porch but it’s rather small. Loved seeing these. We don’t have a porch; I don’t know if many people do in our city, as they are not something usually built here. I like your ideas! I especially like the idea of bringing your bird cages out. Those would look beautiful. I so miss front porches. This is what gives a southern home its character. These are great ideas! The one thing my house is missing is a front porch like my Grandparents used to have. When you get yours decorated I will come drink tea on it. I’m going to have you over soon! I’m thinking of painting the porch, we’ll see. I want it to be white, like the trim of the house.